Publisher: Chatto and Windus, London, 1879. Condition: Decorative cloth, pocket size. Good. Some wear to cover, spine sunned and frayed at the edges, edges tanned. 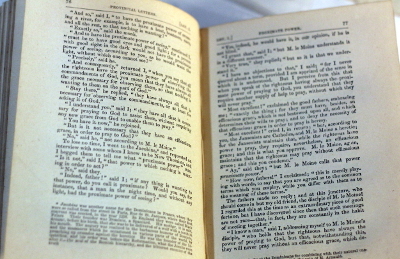 Binding tight, text clean. Small font. 348pp excluding publisher’s catalogue. 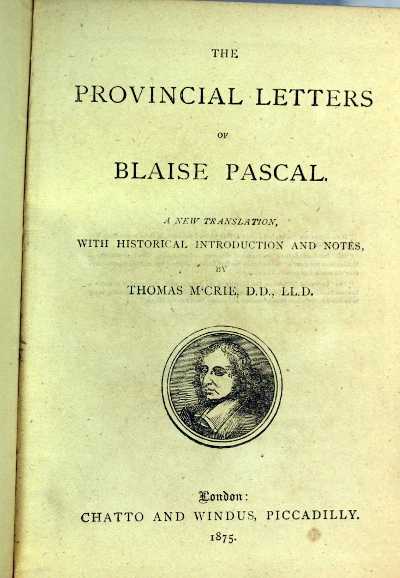 The Lettres provinciales (Provincial letters) are a series of eighteen letters written by French philosopher and theologian Blaise Pascal under the pseudonym Louis de Montalte. Written in the midst of the formulary controversy between the Jansenists and the Jesuits, they are a defense of the Jansenist Antoine Arnauld from Port-Royal-des-Champs, a friend of Pascal who in 1656 was condemned by the Faculté de Théologie at the Sorbonne in Paris for views that were claimed to be heretical. In these letters, Pascal humorously attacked casuistry, a rhetorical method often used by Jesuit theologians, and accused Jesuits of moral laxity. Being quickly forced underground while writing the Provincial Letters, Pascal pretended they were reports from a Parisian to a friend in the provinces, on the moral and theological issues then exciting the intellectual and religious circles in the capital. 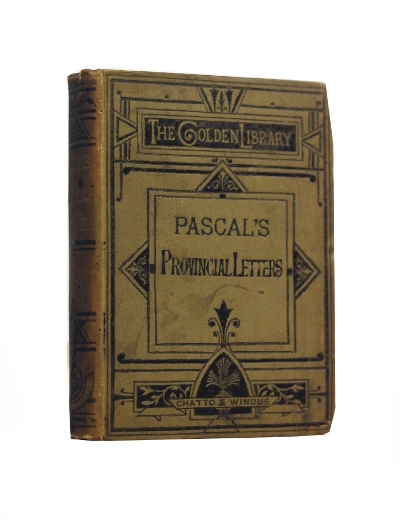 In the letters, Pascal’s tone combines the fervor of a convert with the wit and polish of a man of the world. Their style meant that, quite apart from their religious influence, the Provincial Letters were popular as a literary work. Adding to that popularity was Pascal’s use of humor, mockery, and satire in his arguments. The letters also influenced the prose of later French writers like Voltaire and Jean-Jacques Rousseau. Brilliantly written by Pascal, the Provincial Letters would not have been possible without the work of theologians from Port-Royal; indeed, most of the arguments Pascal deployed were already to be found in Arnauld’s Théologie morale des Jésuites, something which led the Jesuit Nicolas Caussin to reply to Pascal’s perceived libel. Pascal’s main source on Jesuit casuistry was Antonio Escobar’s Summula casuum conscientiae (1627), several propositions of which would be later condemned by Pope Innocent XI.